Finally! I am writing a decent post. Sorry for flooding you with the teasers and lousy photo posts. Blame it to my busy schedule, pending works and partly, the laziness to write. So where have I been in the past few days? One of my readers guessed it right. Yes AC, I flew to Hong Kong with some of my colleagues. Before I share my Hong Kong experience, allow me first to relate the story of my unplanned trip. Early this year, Cebu Pacific offered seat sales to different Asian destinations. My colleague invited me to join and I easily gave in. Hours after booking the flight, my stupidity and adrenaline rush subsided. I woke up realizing that I am not financially prepared. I made second thoughts but I decided to hold on to my two f's; faith and fate. I exhausted all means to finance my trip and I believe the heavens also connived with me. So there! I was able to add a second country in my traveled list. We stayed in Hong Kong for three days. Since we were working on a tight budget, we preferred not to avail the expensive hotels. We opted to stay in a cheaper yet safe and clean guest house. We also considered the fact that we are out in the streets in our entire stay. Hence, we might not be able to maximize and enjoy the facilities of a five star hotel. Our forecasts were accurate because of the three days we stayed in Hong Kong, we leave our place at 10 am and return the next day at 2:30 am. Phew! We were literally living in the streets of Hong Kong. I really appreciate pieces of greeneries in the middle of the hustle and bustle of the city. The next pictures were captured the next morning. A number of my friends and relatives told me that Giordano is cheap in Hong Kong. In my experience though, not really....There's only minimal difference against Manila prices. In the Philippines, most boutiques are found in enclosed buildings of shopping malls. The system is not the same for Hong Kong. You would often see branded to signature shops scattered along the streets. After dinner, we went to the Avenue of Stars. We decided to take our Hong Kong adventure to the next level so off we took the long walk. My companions were likewise very particular about spending so we avoided taking expensive taxis around the city. We visited the Avenue of Stars late in the evening, which in my opinion is not a good decision. The Avenue of Stars is located along the Victoria Harbor waterfront. During night time, the place is cold, dark and foggy. You cannot observe the spectacular view of the high rise buildings, it's hard to take decent pictures, and worst, you might catch colds from the unfavorable temperature. 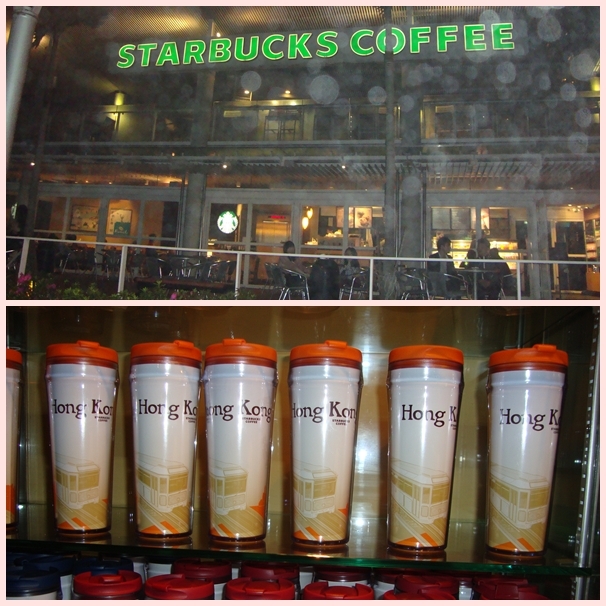 Like my friend T, I am starting to collect Starbucks' tumblers of the places I have visited. Too bad, Charlie Brown Cafe already called it a day. I think you have a second career as a travel writer. What a fun trip. Good idea about not staying in the expensive hotels and using your time exploring the city. I laughed at that sign too....a picture is worth a thousand words. This is amazing. I am completely inspired by your random trip to Hong Kong!!! I hope it was all that you hoped for and more! I have got to look into going on an international trip with my friend! Your pictures and stories are amazing!!! oh I loved all of these pictures!! so exciting and far away...makes me want to visit!! thanks for the tour! I would love to go to Hong Kong! I've had a few friends visit, and they really enjoyed their trip.